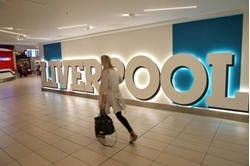 Rock star's tirade against Liverpool John Lennon Airport . Beatles Radio: The Beatles, Solos, Covers, Birthdays, News The Fab 4 and More! Rock star Steve Van Zandt launched a blistering attack on Liverpool John Lennon Airport today, even calling on Yoko Ono to remove John Lennon’s name from the site. The E Street Band guitarist posted a Tweet on his account this afternoon, criticising his band’s experience while being checked by security on arrival at Liverpool. Van Zandt is currently in the UK touring with his band, Little Steven and the Disciples of Soul, which played the Liverpool O2 Academy last night, June 30.